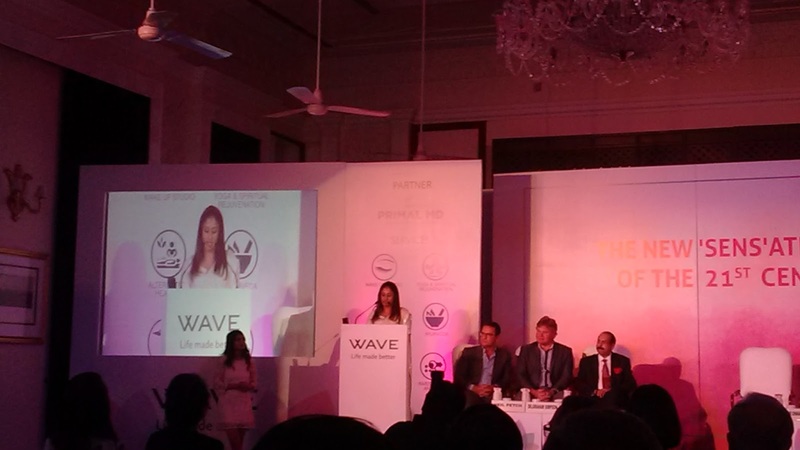 The plot- Aditya Raisinghania is a senior investment banking manager at the prestigious Greater Boston Global Bank (GB2) in Mumbai. Cirisha Narayanan and her father walk into BG2 on a warm summer morning of 2000 for a huge loan amount. Cirisha is a research scholar at M.I.T Boston struggling for a permanent job there. The duo meet and get married a year later. While both are doing well in their fields, Aditya bumps into his old classmate Shivinder who is a top shot with a footwear giant. 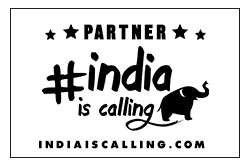 Aditya helps Shivinder professionally to inflate the profits of the company on papers and cook up a false success story to attract international investment. Aditya soon gets promoted to the head of the bank, Shivinder is able to show profits for the company and together they literally mint money. Meanwhile Aditya and Cirisha’s marriage starts to fall apart because of the growing distance between them. 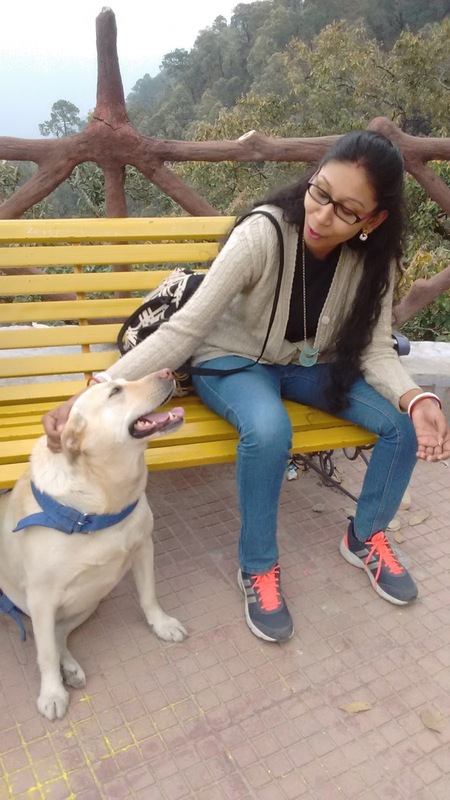 Her frequent trips to Boston and absence in Mumbai frustrates him. To make the marriage last, Cirisha comes to India on a long break for a research project only to find something fishy at Shivinder’s company. 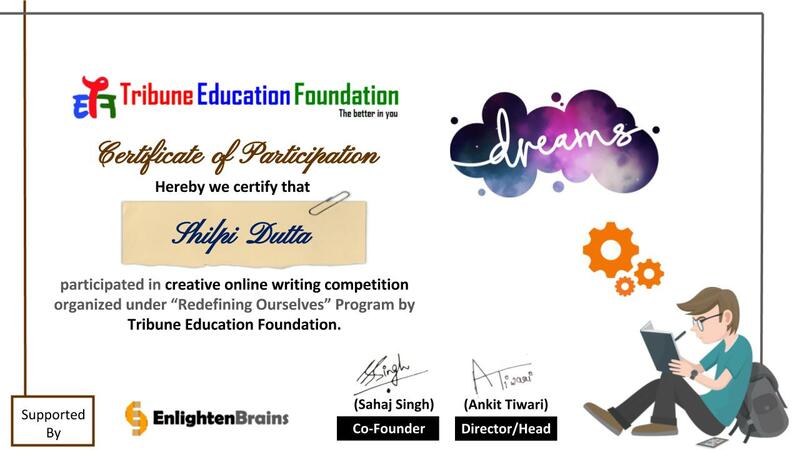 Oblivious of Aditya’s involvement, she requests authorities of the parent company to investigate the fraud. The whole scam balloon built by Aditya and Shivinder bursts one day, costing Aditya his job. Aditya moves to Boston with Cirisha in quest of a new career. The worse and unexpected happens when an esteemed M.I.T professor supports the National Rifles Association (NRA) against the favour of gun control and wins several accolades across the country for his book. Richard, Cirisha’s colleague and closest friend, is also struggling for a permanent tenure in M.I.T since long. A frustrated Richard, on losing his last chance of tenure during the campus interview allegedly shoots the council members before shooting himself dead. Multiple rounds of chasing the culprits, protecting the victims and fishing out the clues happen. What follows next puts the readers in awe with an unexpected series of incidents, difficult to believe. The 319 page book is a true thriller that involves financial fraud, politics in educational institute, murder of characters, all driven by desire and greed! The story is quick paced without a single boring or dull moment. It keeps you riveted throughout. At least I was engrossed thoroughly! 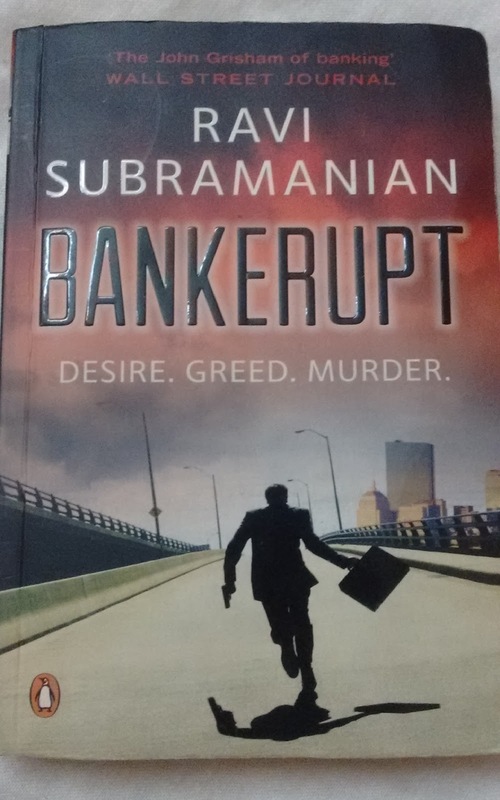 Subramanian’s style of writing is unique where he keeps the chapters short, interesting enough to keep readers at the edge of their seats. The character portrayal is good, could have been better though. 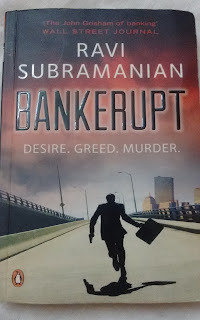 Bankerupt lives up to its name and the tag line (desire, greed, murder). The plot is very well written and sub plots neatly weaved in together.The climax is not a happy ending fairy tale. It’s tragic and sad, leaving the readers thinking about the protagonist’s future. (I do so when I am totally attached to the characters). Spoiler, loopholes of plot- Mr. Subramanian, why did you kill the character and take the story in reverse? By the time the actual story is revealed, the readers forget the initial incident and the time warp. Secondly, checking email is one of the first things on a crime investigation, especially when a prestigious institute is concerned. Thinking of doing so and hacking a password would not have been difficult by Boston police team! Recommended for- Thriller lovers, or Finance professionals in large corporates who would love the story and its twists. My rating- In spite of a gripping plot and quick pace, I would rate it 3.5 on5, owing to a weak climax and loop holes in the plot. 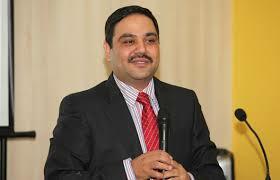 About the author- (Source:Wiki page)- Ravi Subramanian is a banker by profession and an alumnus of IIM Bangalore. Post a career spanning two decades in the banking industry, he has authored novels such as Devil in Pinstripes, If God Was a Banker, The Incredible Banker, and I Bought the Monk’s Ferrari. He is also a columnist for The Economic Times. He has won the Economist Crossword Book Award twice, and has also won the Indiaplaza Golden Quill Book Award. Fine dining at Palmyra restaurant, in Hotel Bristol, Gurgaon turned out to be our best experience ever. In spite of the fact only veg food was served during Navratra, the absence of non veg food was not felt at all! The credit goes to Chef Somnath Porel, who made his way to our hearts with his innovation at food. The spread comprised Daal Makhni, Stir Fry Vegetables, Makhana Kaju Matar gravy, Paneer Butter Masala, Veg Biryani, Potatoe. 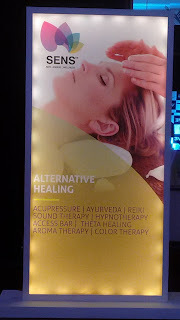 Needless to mention, there was a huge layout of salads, curd and sprouts for the health conscious ones. Let me save the best for the last. So I will come to desserts later. With Bon appetite we tried tasting everything from the huge platter, ensuring not to regret later by missing anything nice. The most interesting pick was Dofinose Potatoes. What looked like Lasagna tuned out to be a potato dish! With the first bite of it, my eyes started looking for Chef Somnath wanting to ask him the recipe of the fabulous item. He acknowledged our query and revealed the recipe. The layers of raw potato, spread with cheese & spices were baked and simmered together, letting the starch of potatoes act as the binding agent. It tasted fantabulous! Had never seen or thought of a unique recipe before this! Somnath loves to experiment with food and his skills were clearly seen in the dishes served. He wanted to give a twist to more dishes, but was asked by the manager not to go overboard since too much of experiment is also not welcome often. Chickpeas or choley what we have at usual restaurants is always spicy and loaded with fat. I always visualized choley in Punjabi style tadka and spices. But here Somnath gave a surprise twist to chickpeas with so much creativity. Eggplant, tomatoes, capcicum in the dish of chickpeas and auberbine tagine which traditionally is stew of spiced meat and vegetables prepared by slow cooking. Somnath had smartly replaced meat with chickpeas. Now, who in a restaturant wants to have an eggplant? You surely can’t say no after tasting this! The preparation was light, not spicy and very well prepared. We savored every bit of it. Stir fried vegetables made with baby corns, broccoli and red bell pepper was another mind blowing item. I can have it as snacks for my hunger pangs! The dish was in low salt while the vegetable stock acted as the soup. I also went gaga over the colorful Kaju Matar Mushroom Makahana. As I started to feel hungry again while writing this, you would feel the same just by looking at the pictures! Paneer Butter Masala and Daal Zaafran were the usual but without fatty cream or hot spices. The veg biryani was the best with the right amount of spices and aroma. Somnath agreed Biryani is not about oil. It’s the combination of flavor, color and appeasing aroma that should keep you asking for more. He had ensured less oil and calorie in every dish he prepared. A health conscious chef who also had the heath of diners in mind. Now coming to the best spread and revealing the surprise- Desserts! Chef Somnath’s magical touch to sweets were fascinating. The one I loved the most was Banoffee Pie. After relishing the whole portion, I ran to Somnath again asking for the recipe. (I just could not stop myself). 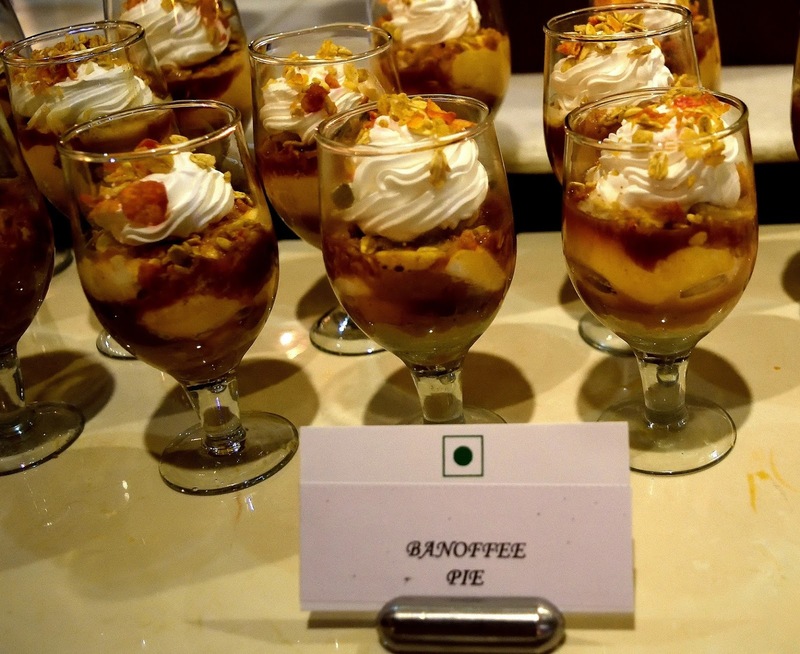 With base of biscuit crumbs, he layered the glass with caramel, mashed banana, dry fruits, muesli and whipped cream. The first bite I took rendered me speechless. I dug into it till I gorged the whole of it, only wishing to have more but wasn't able to. While hubby enjoyed the Red Velvet Tiramisu, I tasted a bit of it. Less sugar content and absolutely light, it melted in mouth. With a full tummy, I gave kalakand a miss, though had a bite of the yummy rabri with jalebi. I over ate that evening completely ignoring my calorie intake count. As a food blogger, I rate the place an easy 4.5 on 5. While a good ambience of a restaurant for fine dining is a minimum requirement, it cannot be ignored while rating the restaurant. Many restaurants don’t bother to look after the seating, which should be upto a certain level making customers feel easy. At Palmyra, the seating was comfortable, lighting was pleasant and the service staff was excellent. One can dig into a huge variety at this restaurant. Highly recommended place for fine dining. Want to cook something new, but are pressed for time? No time to buy groceries for a dish you want to prepare? Don’t have an idea about the measurements of ingredients? Okay then, http://www.cookfresh.in/ comes to your rescue! A new online venture with an innovative concept especially beneficial for the professionals on the go. Cookfresh measures, packs and delivers fresh ingredients for a recipe you select on the website. This is claims to be India’s first food delivery service that gives you the tools you need to be a gourmet chef at home! Impressive, yeah? If you don't have a lot of experience in the kitchen, Cookfresh is a great way to learn how to cook and start working in the kitchen. You could use Cookfresh for a date night in cooking for your partner, or as a great gift for your foodie friends! 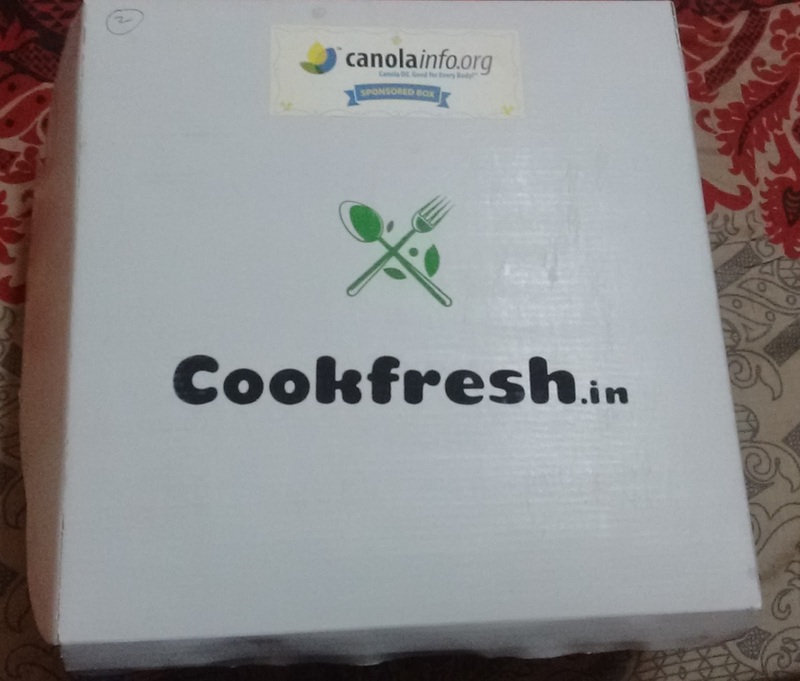 While you can read about them here http://www.cookfresh.in/about-us, let me show you what I received from them. Freshly cut, assorted, neatly packed and labelled. The ingredients for salad included- Lettuce leaves, chopped capsicum, tomatoes, onions, red bell pepper, yellow bell pepper, black olives, canola oil, red wine vinegar, feta cheese and oregano. So all I had to do was to mix all veggies together and add canola oil, vinegar, feta cheese. Sprinkle oregano as per your taste. A healthy salad was ready in 5 minutes! Castor sugar, canola oil, milk, cocoa powder, Nutella, flour, baking soda. Every item was in leak proof locked pouch and labelled clearly. -Whisk dry ingredients in a bowl followed by mixing the oil and milk. Whip the mixture to form a smooth batter, ensuring no air bubbles are left. -Drop Nutella in the middle of the batter. No need of poking or pushing it down. -We placed the batter in microwave for 70 seconds. The only difference was we did not keep the batter in a mug but a microwavable bowl. 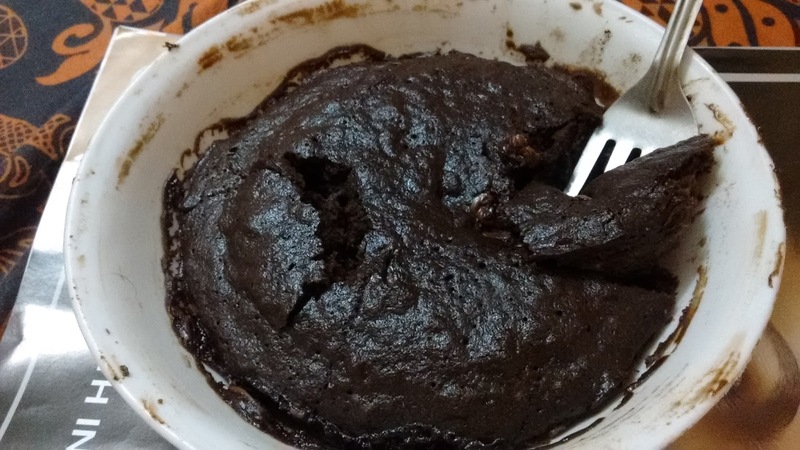 I call it Choco Lava Cake and it was ready in a minute!!! Super impressive and quick it was. Yeah? You see, mixing ingredients and getting the dish ready, barely takes time. What’s time consuming is assembling the ingredients. Finding time to buy groceries is the first step and then washing & chopping them consumes more time. For people like me, bad in the kitchen, are lost and scared about the measurement of the ingredients. For example, baking the perfect cake has been my dream since long but I could not make it because of poor measurements. Either baking soda would exceed the limit or sugar would fall short. Oops. May I confess, this Chocolate cake was the best ever made by me? (Okay, hubby helped, so made by us) Thanks to Cook Fresh to send the right mix and proportion of ingredients to churn out great delicacy! Cook Fresh delivers in most of the areas in Delhi NCR. Delivery is free, however a minimum delivery may be required for a location not listed in the website. Pay cash on delivery or online. Call +91 9971 835722 or shoot a mail to contact@cookfresh.in for more info. Minimal “bad” fats: Compared to common culinary oils, canola oil has the least saturated fat (7 per cent) – less than a third that of rice bran oil (25 per cent) and half that of sunflower (12 per cent), olive (15 per cent), soybean (15 per cent) and groundnut (19 per cent) oils. Canola oil is also free of trans fat and, like all vegetable oils, has zero cholesterol. Helps protect the heart: According to scientific studies, 1.5 tablespoons (19 grams) of canola oil a day may be enough to help keep the cardiologist away, when used in place of saturated fat. That is for just a few rupees a day. The US Food and Drug Administration authorized a qualified health claim for canola oil’s ability to reduce the risk of heart disease when used instead of saturated fat. Helps control blood sugar: Canola oil can help control blood sugar in people with type 2 diabetes when included in a low-glycemic index diet (one that minimizes changes in blood sugar levels), according to published research, because of its high monounsaturated fat content. Adding canola oil to the diet is a simple way of helping control blood sugar. May reduce belly fat: Canola oil was shown in a clinical trial to lower belly fat when used in place of selected oil blends in a heart-healthy diet for weight maintenance. Belly fat is one of the five criteria for metabolic syndrome. Reducing it can decrease blood pressure, blood sugar and triglycerides and increase in HDL cholesterol. Those who consumed canola oil on a daily basis for four weeks lowered their belly fat by 1.6 percent. Good source of heart-smart fats: Canola oil is rich in two polyunsaturated fats, omega-3 (alpha-linolenic acid) and omega-6 (linoleic acid). These fats are considered essential because the body cannot make them on its own. Of all common cooking oils, canola oil has the most plant-based omega-3 fat (11 per cent). It substantially reduces total and LDL cholesterol levels when used in place of saturated fat. Good source of vitamins E and K: Canola oil is a good source of these fat-soluble vitamins. Vitamin E is an antioxidant and vitamin K plays a key role in healthy blood clotting. May protect against breast and colon cancers: Early research indicates the potential of canola oil to protect against breast and colon cancers. Canola oil is a culinary delight: It can be heated to a higher temperature than most other oils before it starts to smoke (smoke point of 242 °C). This makes it ideal for high heat applications like sautéing and deep-frying. Its light texture, mild taste and colourless appearance are a good match for any type of cooking. Its neutral taste does not overwhelm the flavours of other ingredients in a dish, allowing the spices to work their magic and enhance the flavours. Canola oil enhances baking: The delicious nature of baked goods is enhanced by canola oil providing them with a moist, soft texture with no cholesterol and little saturated fat. Replacing solid fats like butter or lard with canola oil allows for a reduction in both total and saturated fat. In fact, total fat can drop by up to 25 percent, sparing calories without sacrificing goodness. With cardiovascular disease a leading cause of death across the world, there is a need to improve our lifestyles and shift to healthier oils in our diets. Canola is a good choice of oil given its heart-healthy qualities, suitability with all cooking methods and cuisines, and affordability among other healthy oils. This is why and more and more people around the world are now making it a part of their kitchen. Nested in the arms of Garhwal region of Uttarakhand, Lansdowne, the little hill station makes a great weekend destination. 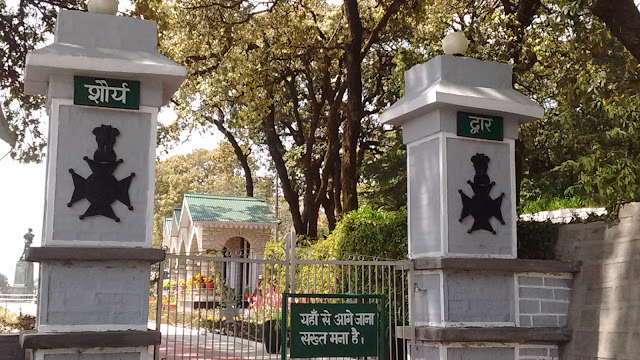 Founded by and named after Lord Lansdowne in 1887, this is a cantonment area housing the Garhwal Rifles command office. 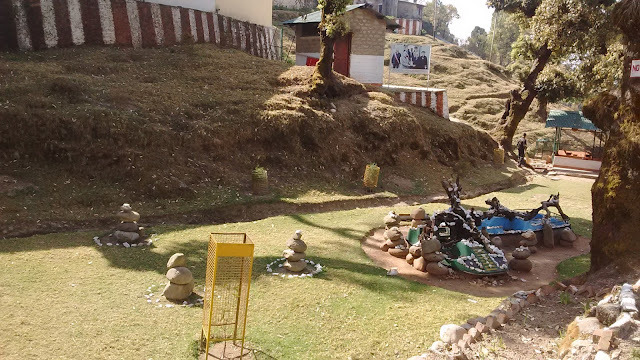 Situated approximately 1,700 above the sea level, this is said to be one of the quietest hill stations of India easily connected by motorable roads. I had heard the name of Lansdowne long time ago from a friend who had frequented the place for short holidays. Seeing the beautiful images, my urge to visit Lansdowne grew by many folds till I got a chance in March 2016 during the long Holi weekend. Where- In the Garhwal district of Uttarakhand. 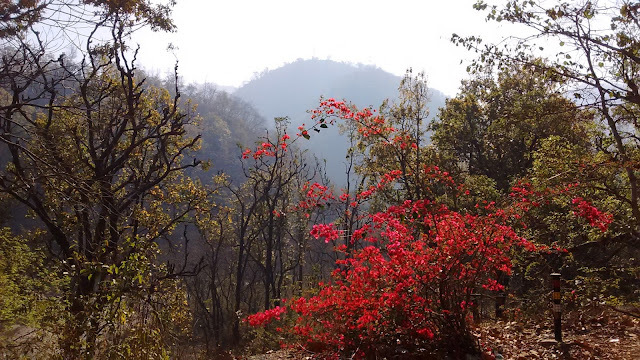 Lansdowne is the closest hill station from Delhi NCR. 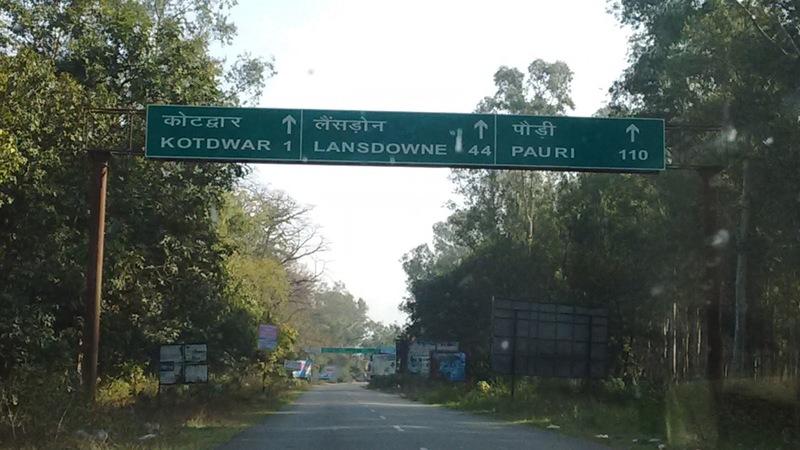 Lansdowne is located at a distance of 270 km from Delhi. One can drive to place easily, provided you leave early morning, saving yourself from traffic snarls that usually occur in Ghaziabad or Modinagar. No Volvo or train service is available to Lansdowne. You can hop into a local bus or jeep from Kotdwar to Lansdowne, if you want to use public transport. The roads are good, only broken in few places. Khatauli to Kotdwar highway is smooth, without potholes. The only turn off would be the reckless cutting of trees on the way. (We noticed that on way back). Expect sharp turns on the hilly curvy roads from Kotdwar to Lansdowne. You ought to drive slow and carefully! The whole driving distance may seem quite long until you reach Kotdwar and the sudden sight of mountains instantly would excite you. 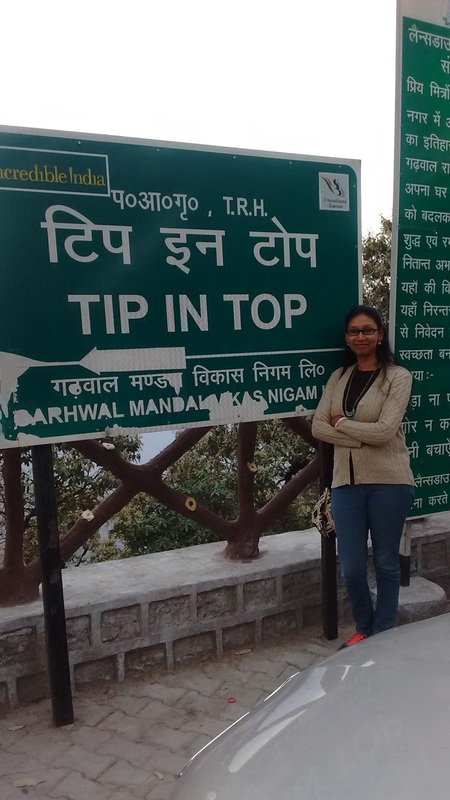 There was something about the place that kept us rejuvenated inspite of the long drive from Gurgaon. Was it the chill in the air, the neat & clean roads or the mesmerizing hills? Shops re-opened post 3 pm and we dug into whatever food was available at the first shop in sight. 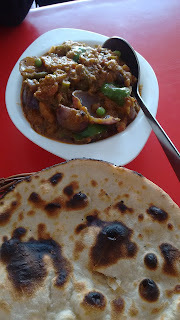 You will NOT find many eating joints/ restaurant in Lansdowne, so you have to settle with the ones at Gandhi Chowk, though small tea stalls are available in lanes and inside the market place. 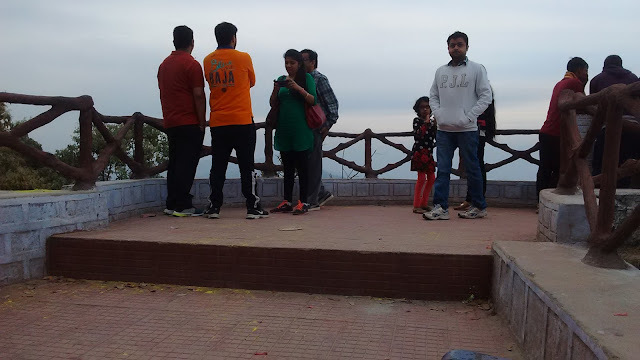 Driving within the hill station, is not recommended for many reasons- You pollute the place, you don’t get to enjoy the beauty, you lose the opportunity to walk and connect with nature, you would never enjoy the weather. Being responsible and aware tourists, we decided to walk around and see the place. Barely a kilometers away, Bhulla Taal topped our must-see list. 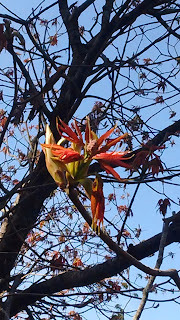 On the way, pine trees, spring flowers and beautiful nature kissed with warm sunshine greeted us. The peacefulness and serenity of the place is so relaxing. It was a pleasant break from the city hustle bustle. 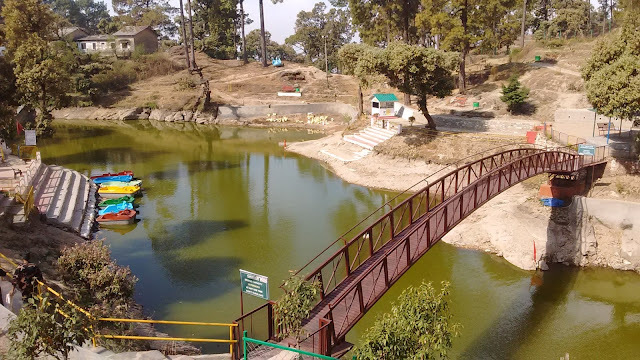 Bhulla Taal is an artificial lake maintained by the Garhwal Rifles regiment. 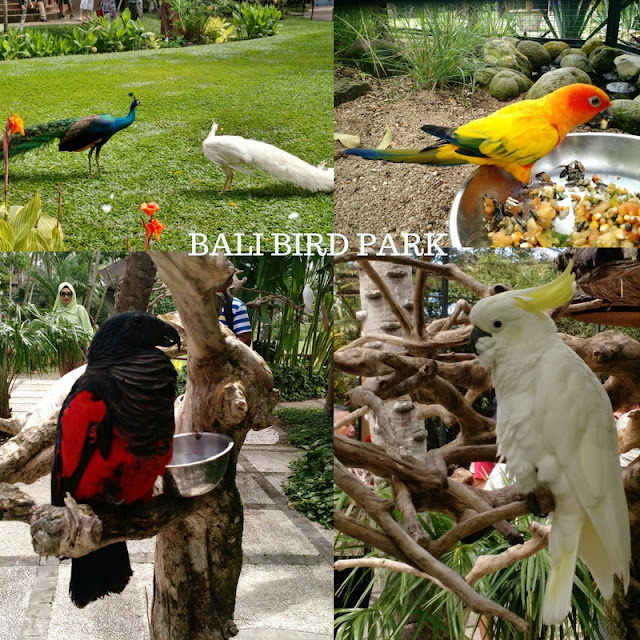 The neat and tidy place is surrounded by forests and an enclosure for rabbits & birds. You can enjoy boating in the lake for 30 minutes at Rs. 80 per seat. Entry in the premises is charged at Rs 20 per person. Hubby enjoyed taking pictures of the lovely ducks while I soaked in some sun. A small souvenir shop run by the army wives welfare association in the premises gave me some time for shopping too. Gift items were a little over-priced there, yet I bought a sling bag for the sake of a small contribution to the army wives who lost their husbands in the line of duty. 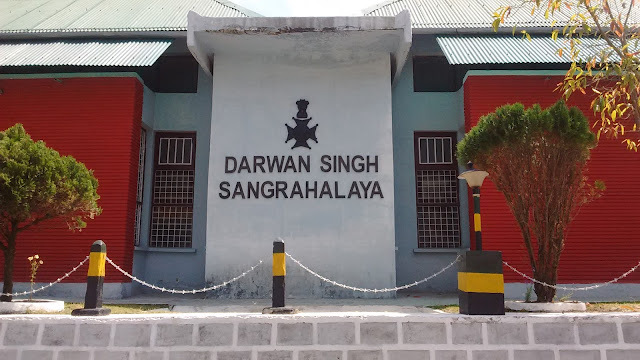 After spending an hour and a half, we headed to Darwan Singh Museum, barely less than a kilometre from Gandhi Chowk and we chose to walk to it. Named after the Victoria Cross holder Naik Darwan Singh Negi, this museum was founded in 1983 with the rarest collection of Garhwal Rifles. It showcases artilleries, coins, swords, pictures and much more from pre-independence era to recent wars. The tour of the museum was a treat to eyes! One can spend a good one and half hours to re-visit the rich History. Hubby’s joys knew no bounds on seeing the rifles and heavy duty war weapons. The brave one who laid their lives for the country also have their names on the wall of fame. Taking pictures inside the museum is prohibited, so we settled with pictures outside in the flower garden and war memorial. 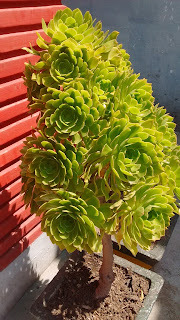 The plant that caught my eyes was Handrea, also known as Green Lotus, which is imported from Russia. The petals of the Handrea resembled rose petals and the plant itself resembles a closed lotus flower. Could not resist taking pictures of this beauty! The war memorial is next to the museum building in Parade Ground, entry to which is restricted for public. With deep thoughts of war and the fallen heroes, we left from the museum to Gandhi Chowk for lunch. Out of the few eating joints, this time we had lunch at Oaktown’s Flavour Restaurant. Lemonade followed by “Veg Handi” (Mixed vegetables) and hot tandoori roti made a fab lunch. Post walking quite a distance, we retired to our room and relaxed till evening. Gandhi Chowk market peps up during evening with tourists and beautiful lights. 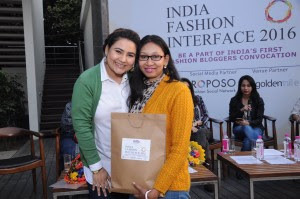 You cannot indulge in handicrafts or clothes shopping since Lansdowne is not a commercialized place yet. However, the place has its own charm. Small tea stalls, regular grocery stores, little vegetable shops or bakery shops, every little store compels you to stop as you pass by. A walk after dinner around the Gandhi Chowk round-about is a must do for all. Shops start to close after 9pm. The streets are safe even during the wee hours. As we walked hand in hand, soaking in the stunning full moon light and pleasant air, the romantic night grew deeper, quieter and more beautiful. Also known as Tiffin Top by the localites, is a vantage point (literally) from where you see the Lansdowne town. 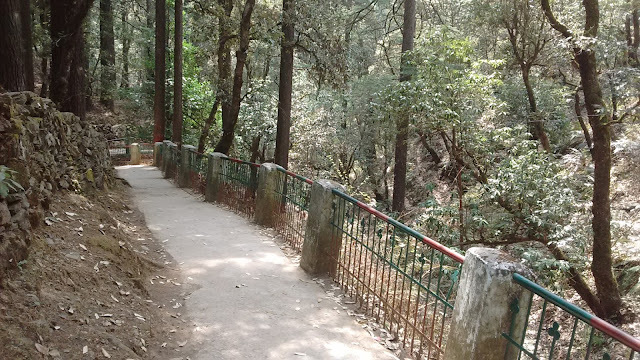 It is a picnic spot fringed by cottages and thick pine forest. There is nothing much to do here apart from taking selfies or pictures of sunrise/sunset. I befriended a lab there, so my visit was worth it. hehe. On the way back, you can visit St Mary’s Church. An old church against rustic backdrop and beautiful trees. The church is open only on Saturday and Sunday. 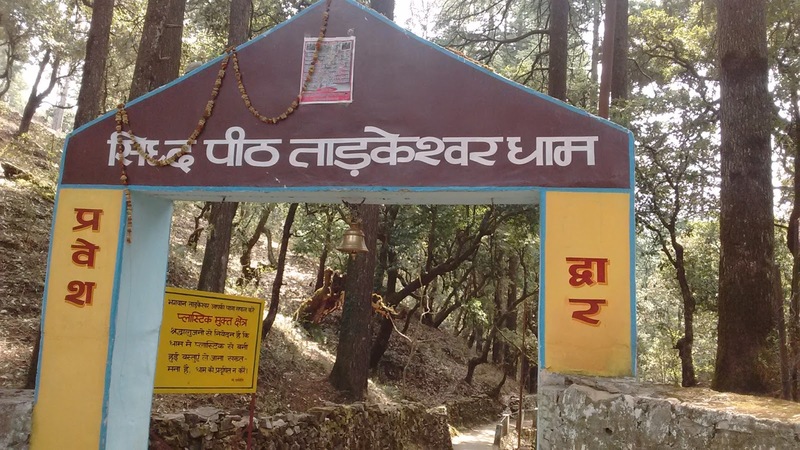 Tarakeshwar Temple- About 40 kilometers away from Lansdowne, this temple dedicated to Lord Shiva is much talked about and visited. The curvy roads are very sharp and bumpy in many places. Advisable not to drive on your own. We hired a taxi. Local shopkeepers offer taxi services at Rs 1200 for a round trip. Since we pooled in with two more passengers, we were charged Rs.600 only. It took us a little more than an hour to reach Tarakeshwar Temple. A long ride on the curvy roads made us giddy. Call it motion sickness or inertia of motion, we could not stand still for some time after de-boarding the cab. 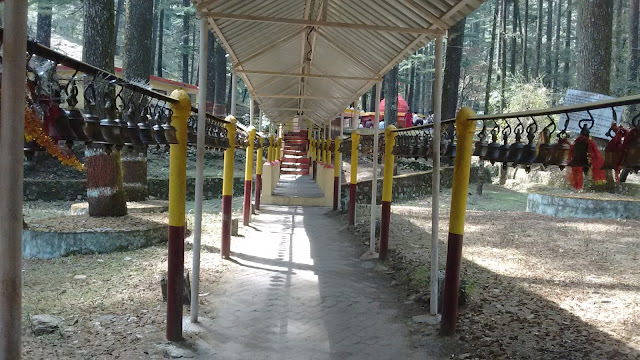 The down-hill walk towards the temple was around 800 meters, which is isolated and feels eerie at times. The moment you see the temple, you enter a totally different frame of mind. 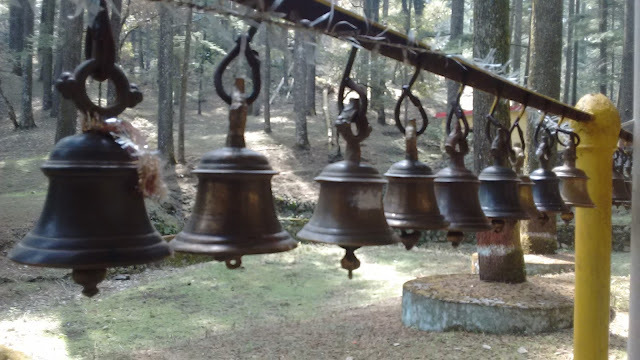 An array of bells chiming in the air reverberates your soul with a positive energy. Surrounding forests, no shops, no garbage, chirping birds- all will make you feel the presence of a strong heavenly force. May be it’s the forest gods and Lansdowne locals have worked hard in protecting them! 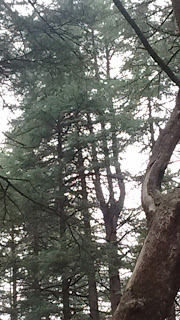 Among the tall pine and oak trees with the backdrop of lush green ground, you will spot a tree top in the shape of a trishul. 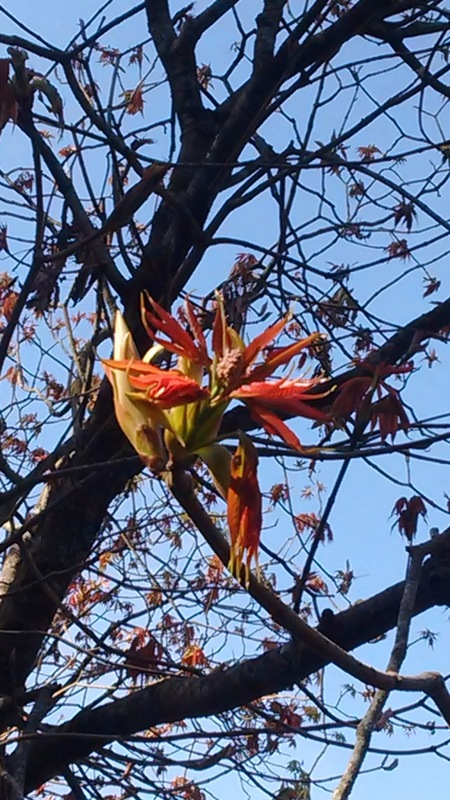 This tree is said to be God’s own tree and is worshiped in the temple. Post the temple visit we spent time in the woods wrapping ourselves with Nature's beauty. Such greenery is a rare luxury in cities. A good time spent and we returned after an hour at the temple. The journey was worth it. -Since Lansdowne is maintained by the Cantt board, it is not a commercialized place, hence leaving you with fewer activities to indulge in. Visit the place only if you want some peaceful time and if you love nature. Two nights are more than enough to spend in Lansdowne. -Weather changes at the drop of a hat. Be prepared for sudden winds or rains. Carry a jacket or shawl even during summers. 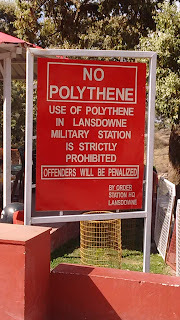 -Consumption of alcohol is prohibited in Lansdowne. So if you plan to behave like a drunk hooligan, you will land up paying a penalty. -The whole town is neat and clean. 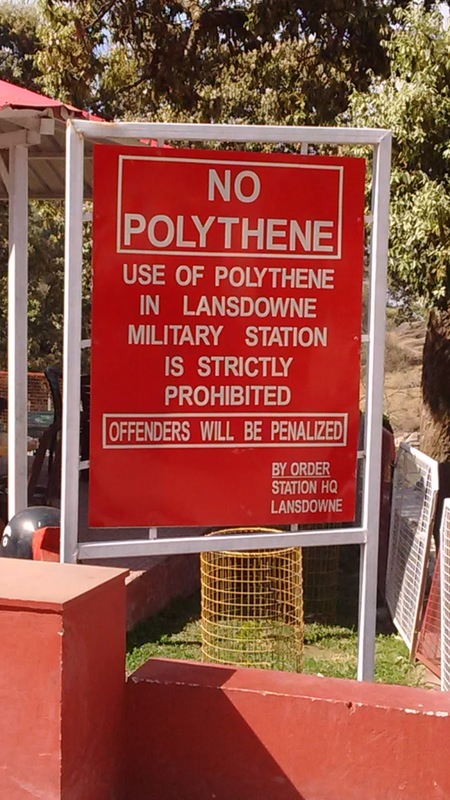 Polythene or plastic is strictly banned and people follow it diligently. Kindly do not litter the place. As a responsible tourist, you never should. Respect the sanctity and rules of the place. Garhwal Rifles has worked very hard to maintain the forests, reduce pollution, and conserve wildlife for which they have been duly recognized. 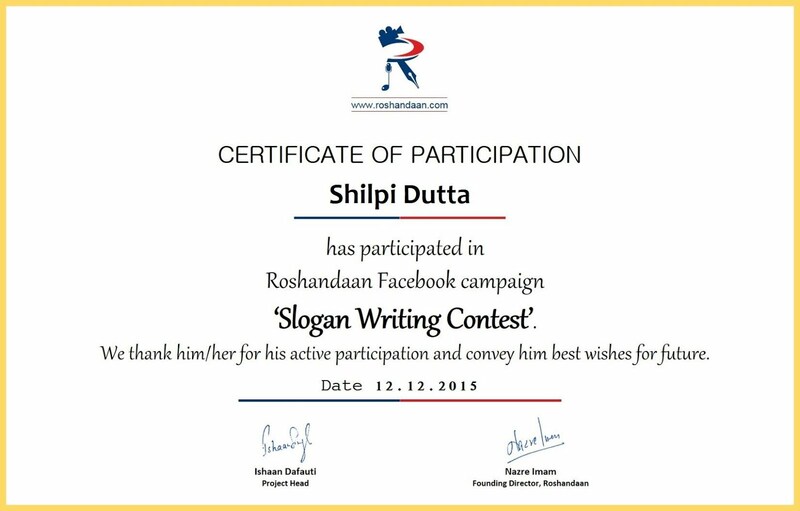 Let’s contribute in our own way, and this will help in our survival. 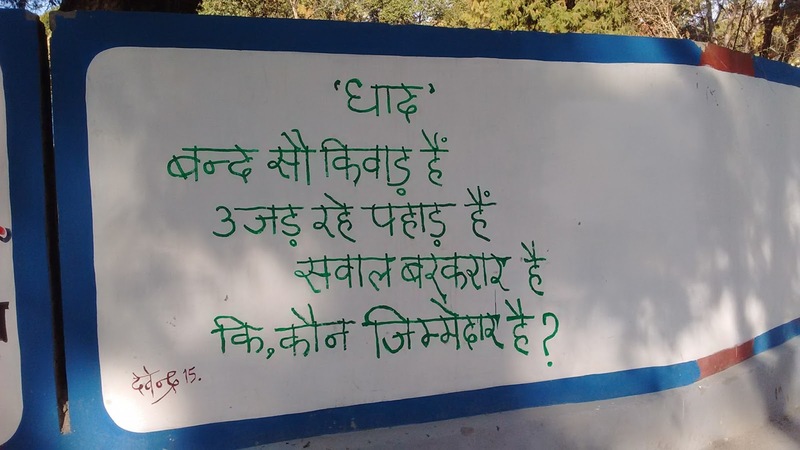 Saw a strong message on a wall there, questioning people on their recklessness.